“Menschliche Ueberreste au seiner Felsengrotten des Düssekthals: Ein Beitrage zur Frage über die Existenz fossiler Menschen.” Verhandlungen des naturhistorischen Vereines der preussischen Rheinlande und Westphalens, 1859, 16:131-153. "Zur Kenntniss der altesten Rassenschädel.” Archiv fur Anatomie, Physiologie und Wissenschaftliche Medicin, 1858, 25:453-478. In 1856, quarry workers at the Feldhofer cave in the Neanderthal (Neander Valley) unearthed an odd-looking skeleton. Fuhlrott was a German schoolteacher who was the closest scientist to the scene. By the time Fuhlrott saw the remains, there wasn't much left, but the skull-cap alone was enough to tell him that this was a human with a difference--low forehead, prominent brow ridges, and sturdier bones than normal. 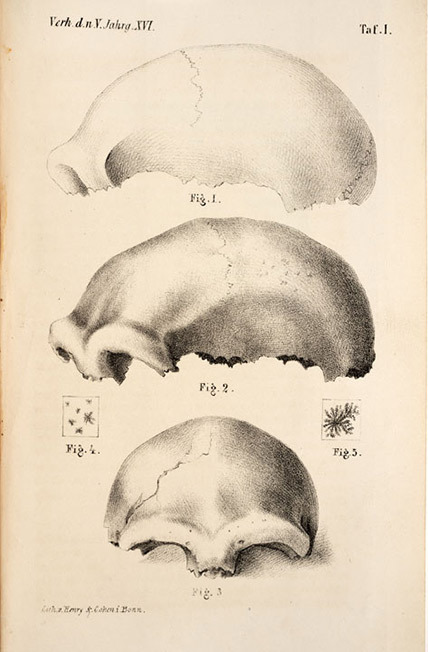 Fuhlrott showed the bones to a professor of anatomy in Bonn, Hermann Schaaffhausen, and the two agreed that the Neanderthal man represented a primitive type of human, and probably a prehistoric one as well. 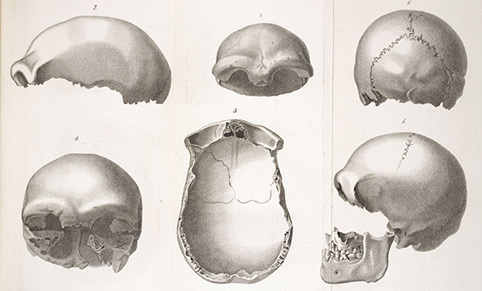 Both published papers on the discovery, and the saga of Neanderthal man was born. Many critics were not convinced that Neanderthal was ancient, preferring to believe that he was a recent human who was pathologically deformed.